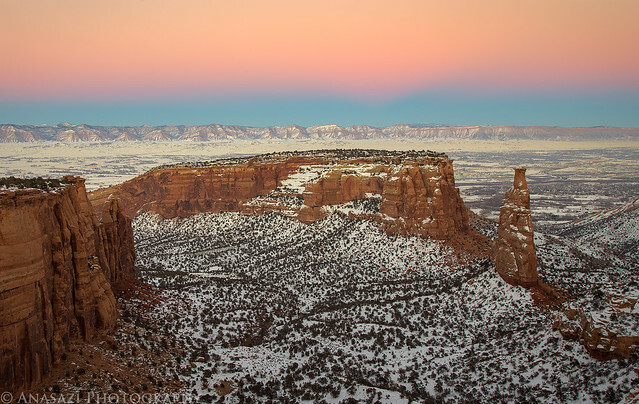 Over the past week I’ve spent a few days photographing the Colorado National Monument again. I stopped by after work a few days, caught a sunrise another day, and drove through the entire park after a morning spent along Rifle Creek. Basically, whenever I had a little free time, I was there. I actually spent a few days concentrating on one small arch that I photographed in a few different kinds of light. It’s amazing how different things can look based on the time of day and the weather. One evening I caught the Earth’s shadow over Red Canyon. 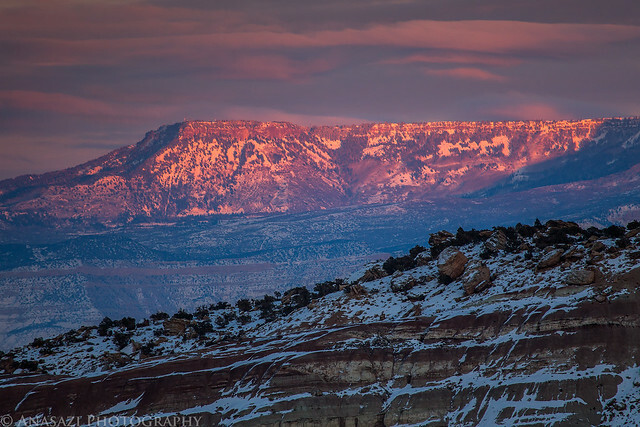 Another evening the Grand Mesa lit up at sunset. 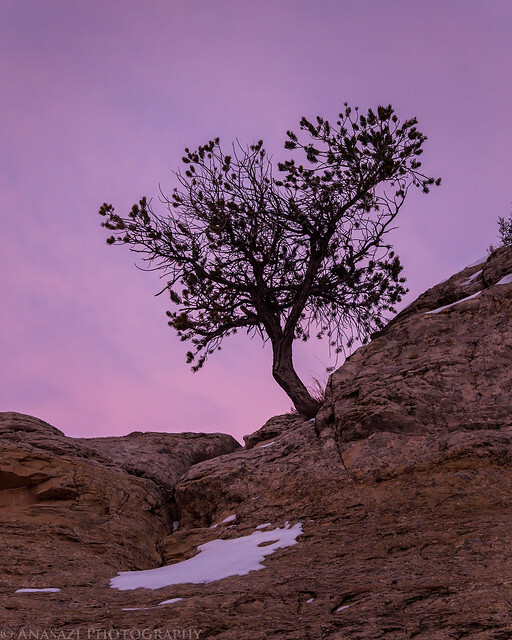 A small tree growing out of the sandstone. We’ve had a very cold start to the year so I’ve been staying close to home more than I usually do. Since that’s the case, I’ve been spending my free time trying to make some more unique images of locations I’ve photographed before, plus I’ve been trying to find some new locations around the Grand Valley. Here’s a few photos from the past couple of days. 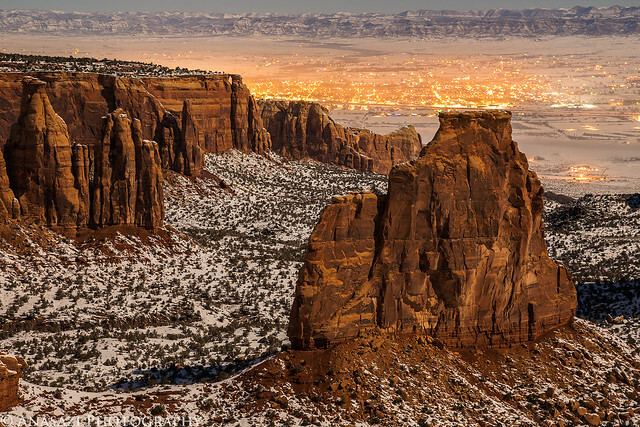 I drove up to the Independence Monument viewpoint after work on Thursday and stuck around after the sun had dropped below the horizon so I could catch the Earth Shadow above the Book Cliffs. Then I stayed a little longer for a photo of Independence Monument in the twilight with the lights of Grand Junction in the background. 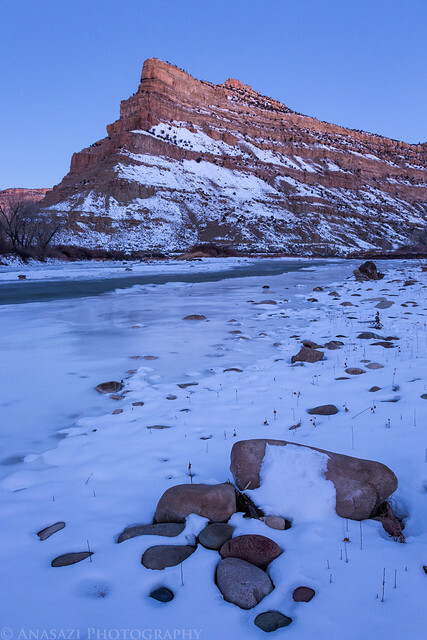 On Saturday morning I was up early to photograph the sunrise photo along the Colorado River in De Beque Canyon. As I was taking a few photos in the early dawn light a man with a dog approached me. At first, I assumed he was out for a walk along the river, but then he mentioned to me that he and some friends were hunting ducks nearby and would be shooting right over the area I was in. I decided it probably wouldn’t be a good idea to stick around, so I hiked back to my Jeep and got out of there so that I could find somewhere else to watch the sun come up. Dawn in De Beque Canyon along the Colorado River. 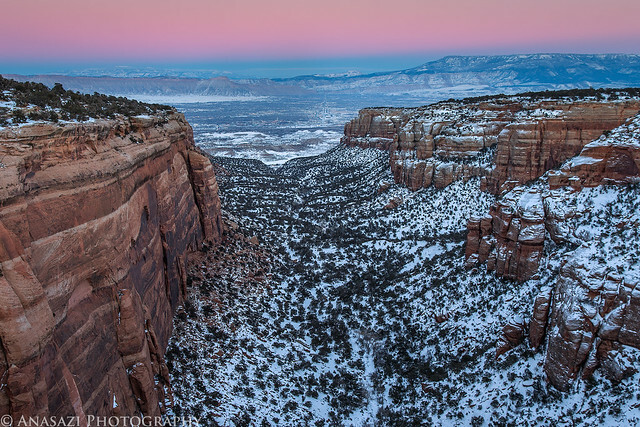 I ended up staying home for New Year’s Day this year and decided to get out for a hike at the Colorado National Monument in the evening. I always keep meaning to hike up Wedding Canyon, but for some reason or another it has never happened yet. I set out to finally hike that trail today, even if it was covered with snow. I didn’t bother bringing my DSLR with me on this hike, so I only took a few snapshots with my little S90 point and shoot camera. 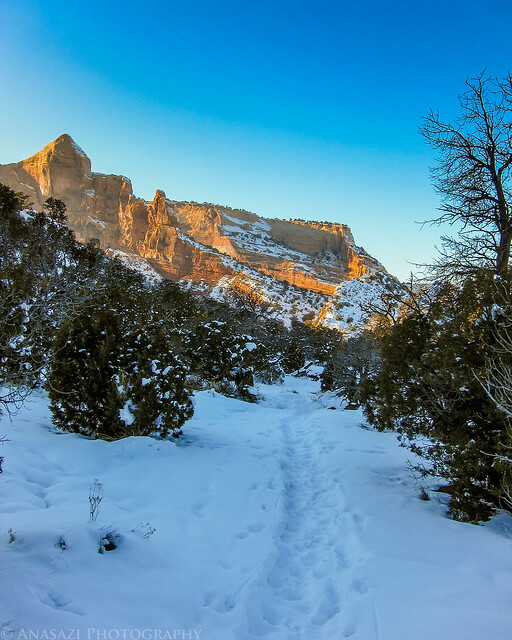 After leaving the Monument Canyon trail, I followed the snow covered trail along the front side of The Island towards the mouth of Wedding Canyon. Looking back as I start my way up Wedding Canyon. This is it! My final trip report from 2012. I sure hope 2013 is at least as good to me as 2012 was. 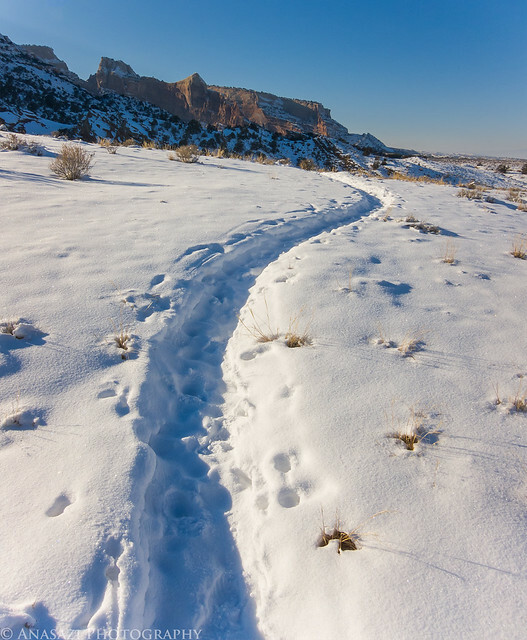 For my final trip of the year I had the urge to get out snowshoeing again, except I didn’t want to just head up onto the Grand Mesa again. I wanted to try somewhere new that still wasn’t too far away from home. 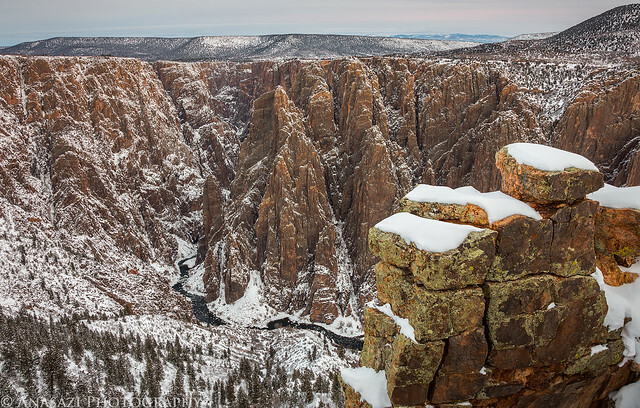 I realized that I hadn’t made it to the Black Canyon of the Gunnison National Park all year and I know they have some snowshoe trails near the Visitor’s Center, so I thought it would be a great place to check out. I left my house bright and early and arrived at the park well before sunrise. Let me tell you, it was cold and windy! I hiked around until I found a view into the canyon I liked and waited for the sun to come up. 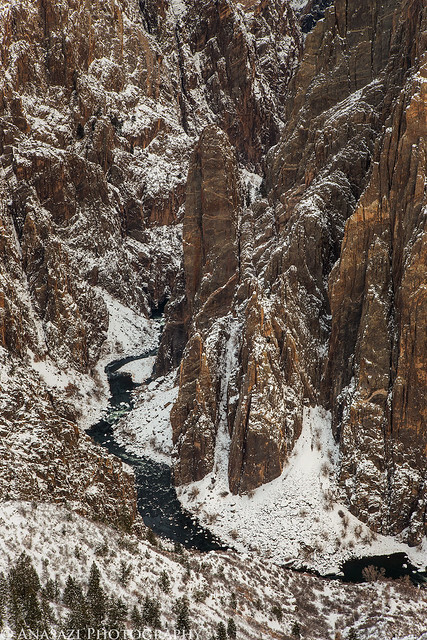 The Gunnison River far below. 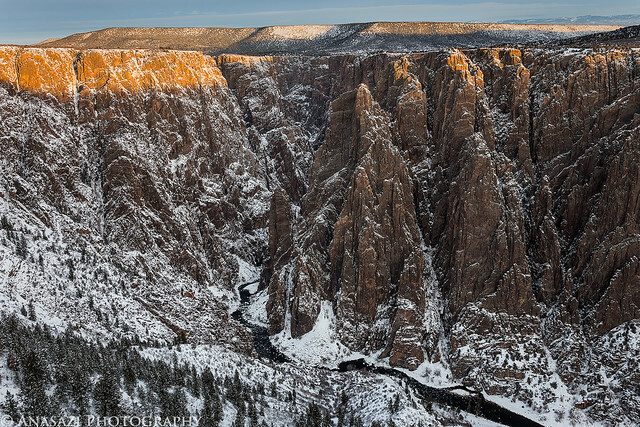 When the sun broke free of the horizon, it lit up the rim of the canyon. 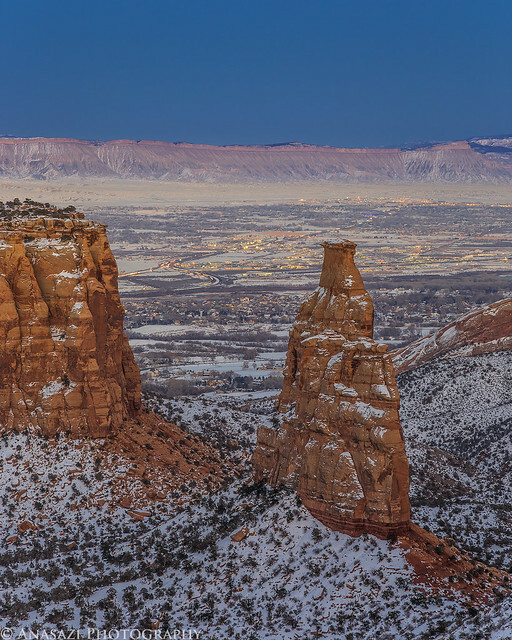 With the full moon out tonight, I thought it would be fun to head up to the Colorado National Monument again and try to get a few photos of the canyons and spires lit by the moonlight with the city lights of Grand Junction and Fruita in the background. 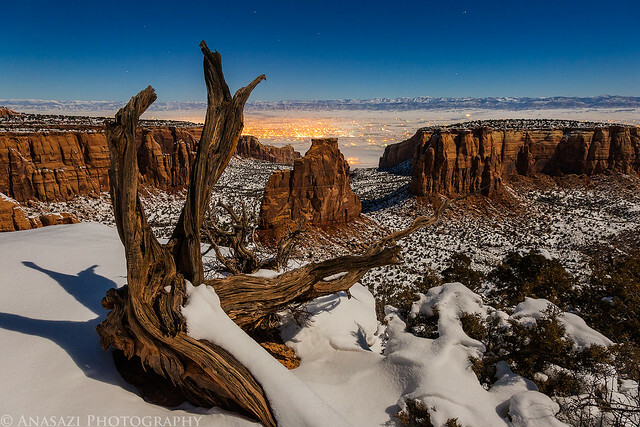 Thanks to an inversion, the temperatures in the valley were pretty cold but, it was much nicer up on the Monument. 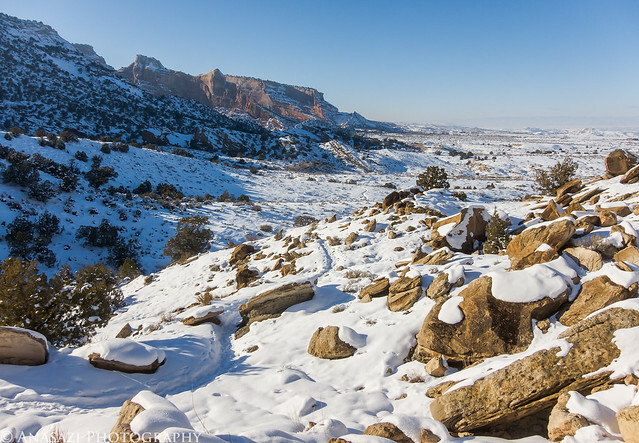 Looking down Wedding Canyon towards Fruita. Independence Monument dominates the foreground. 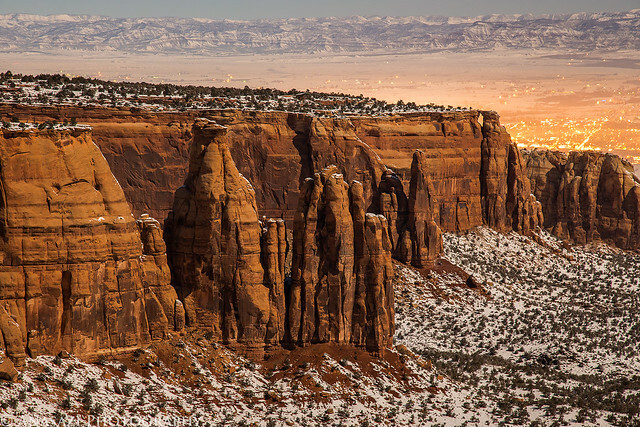 A closer look at the Pipe Organ, Sentinel Spire and Window Rock. I really like this one with the snow, shadows and faint stars.